Neu.de is the German site from the Meetic group, the largest online dating network in Europe. The site attracts around 239,000 people seeking online dating, love, and friendship. Neu has a range of useful features to help you to get acquainted with other people. It is available in German only. Neu Matches people on their personalities. 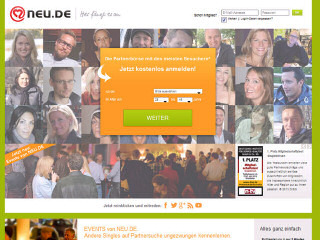 Neu.de is a member of the Meetic family of dating portals. Meetic is the largest dating network in Europe, and Neu.de is their German site. While it is delivered in German, you can have it displayed in one of several other languages by visiting the Meetic site for your country of choice. Most of the members on the site are German, but membership is open to anyone in the world. Neu.de is primarily designed for those looking for long-term relationships. Joining is free of charge, but you will need a paid membership in order to access many of the available features - including emailing. Although the Neu home page claims it takes only 2-minutes to create a profile I found this to be an underestimate. It took me around 20-minutes to complete all sections properly. The personality questionnaire is several pages-long and requires detailed information about your own background and your preferences in a partner. The personality questionnaire is important as ultimately it determines who you will be matched with - for this reason the time needed to complete it properly shouldn't be underestimated. Once you gain access, the layout is pretty standard. As a free account holder you will be able to do searches, peruse photo profiles and send winks. Any attempt at communication will result in being routed to "upgrade now" page. Once you are a paid member, you can send emails, chat in chat rooms and even write your own blog so that other members can get to know you better. You can even access your account via your cell phone and send SMS to other members. Neu is a matchmaking site suited to people who are seeking a compatible romantic partner. Their questionnaire compares facets such as interests, ambition, lifestyle and education. Unlike eHarmony and Parship however it is entirely possible to peruse profiles for yourself. Neu is now part of the Meetic Group. Meetic is known for having created many happy successful couples throughout Europe, but unfortunately many members report that customer support is lacking on their sites and that re-billing is misleading. Rss Feeds. Subscribe to comments for this site. [?] Receive updates about Neu.de directly through your newsreader. Neu is a very good dating site. I want to find a male friend the same situation and can learn to go to a good result (happy family). I have been divorced for 4 years I have a 25-year-old son. Now I'm living one yourself and do accounting for a joint venture. I have been searching for love now for a very long time. I have looked for it but it never found me. i would love to meet a serious woman for a serious relationship. I have a membership with Meetic Germany that I want to cancel. I was just charged Euro 16.65 I suppose for a year membership. I received no emails saying that Meetic was going to bill me. I want to cancel the membership immediately. Any help you can provide here would be appreciated. Again, I want no membership, please cancel immediately! Is Writing on Social Media about Your Online Dates A Good Idea? You Don't Have to Meet Them, Do You? Neu.de 3.83 6 A review of Neu.de. Neu.de is the German site from the Meetic group, the largest online dating network in Europe. The site attracts around 239,000 people seeking online dating, love, and friendship.